A quick note to let people know that my book, Christ, Power and Mammon is now relatively more affordable, the paperback edition just having been released in December. You can “look inside” at Amazon or find it through the publisher’s website here. 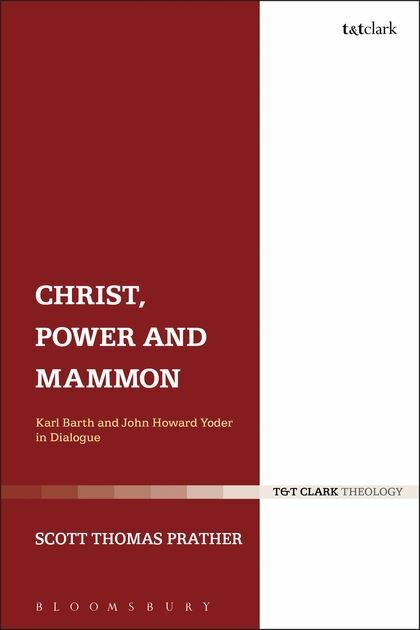 This is not only a book that illumines the work of Barth and Yoder by comparing their understanding of ‘the powers’. Perhaps more significantly, Prather painstakingly elucidates the hold that these powers have on our lives, once money is recognised in these terms. Prather has thus managed to combine elegant scholarship with substantive argument to help us see redemption in a new light. “This intensely reflective and ethically focused interpretation of the ‘theology of the powers’ within the work of Barth and Yoder addresses a central, albeit almost hidden, theological topic in its importance for any public agenda of Christian ethics. Scott Prather’s book presents anew the biblical tradition and the whole range of key questions and discernments disclosing a theological awareness of ‘the powers’ and a critique of their dominance in capitalism and political ideologies. This book is a real guide for the theologically grounded resistance of Christians against any socio-political structures claiming authority in and for themselves. There is a growing literature that brings together the theologies of Barth and Yoder, usually by focusing on Christology. Scott Thomas Prather makes a perceptive and powerfully argued addition to this literature by focusing on something that pervades Yoder’s theology and is harder to dig out of Barth–the dogmatic function of the principalities and powers. Yesterday evening I drafted a petition calling for Mississippi’s elected state officials to stand up for very basic legal measures that could and should be taken to move towards more responsible gun ownership and use in American society. I wrote this after pondering, for a couple of weeks, the insanity of our Governor Phil Bryant’s response to Mr. Obama’s quite modest executive proposals for new legislation. Minutes after Obama revealed his twenty-three point plan, Bryant and House Speaker Philip Gunn issued a predictable but nonetheless insane statement, vowing to do what they can to “block” any new federal legislation on “gun control” that might pass. Importantly, they also rallied the troops in support of the State’s defensive posture, calling on the MS State Legislature to do the same. A couple of weeks after that “Big Government” freak-out, the MS House of Representatives did indeed pass two new bills relating to gun control — but, again predictably, more laws in this respect are “okay”, because these laws actually help weaken public transparency and accountability with respect to personal firearms. While I have little hopes of this petition having any substantial legislative effect, I still thought it worthwhile to see what sort of traction might be gained in terms of starting to build local support for putting pressure on our representatives to think and speak more seriously about the role of guns in our culture. As of now, I am only posting this petition online and disseminating it through various social media outlets, in the hopes of generating an initial buzz through a kind of family-and-friends word-of-mouth forum, but I have vowed to ramp up my efforts at “taking it public” through more traditional media and news outlets if there seems to be enough support. The following is the message I sent to my Facebook network, asking their support, and here I address it to whomever else might come across it on this site. While my target audience is Mississippi residents, and my “goals” for next-level action are based only on MS signees, please read and consider even if you’re not a MS resident, and feel free to sign and pass it along for others to see. In light of recent remarks by Gov. Bryant, who, in mid-January, urged the MS State Legislature to use its powers to “deem illegal” and block any new gun safety measures proposed by the federal government, and in light of recent Bills passed by the State Legislature which further weaken the regulatory capacity of the state with respect to public transparency and accountability about personal firearms, I have written a short petition calling for our elected state officials to change direction and take a stand for common sense measures designed to promote gun safety and responsibility. The language and intent of this petition is general, and, I believe, should find widespread support from thoughtful Mississippians of any and all political stripes. Please consider the words and spirit of this message carefully, and, if you find yourself of one mind with my concern to send a clear message to our state leaders about sober concern for our children, our streets and our homes, please sign this online petition and pass it on to fellow Mississippians for their consideration. While I have not “restricted” potential signees to Mississippi residents, this petition is first and foremost for state residents to send a message to our leaders. With that in mind, if we can reach 100 Mississippian signees by March 7th, 2013, I will attempt to take this petition further to local news agencies and other public outlets, with the hopes of gaining wider support. If we reach that stage and do gain support wider than our personal networks of friends and family, I pledge to do what little I can to make sure this petition is delivered to the named state officials, and to see to it that they respond. I’ve got a new piece in the recent JFP about my return to MS and the state of our record label, Esperanza Plantation. Check it out below: Coming Home to Hope | Jackson Free Press | Jackson, MS.
Bill McKibben and MS River Dredges: A Sign of Things to Come? However, like many progressives and leftists, this whole campaign I’ve personally teetered on what I’m actually going to do with my vote come November — hold my nose and vote for Obama as a small but necessary gesture toward obstructing the more-explicitly corporatist agenda of a Romney/Ryan ticket, or just wash one’s hands of the system and “throw away” one’s vote, by either writing in a loser or abstaining altogether. And, like many, for me the real issue in terms of practical “support” depends on just how seriously we should take the symbolic differences represented in the mainstream media between Obama and Romney. The “new libertarians” I’ve recently been writing against, alongside progressives and other real leftists, are indeed correct on the one basic point that on the most significant political and social threats to authentic democracy in the US and across the globe today, the differences between Obama and Romney are, to quote Cornel West, “more a matter of style than substance.” However, from Ron Paul to Chomsky and back, the single thread unifying the US prophets of systemic doom has been an acute awareness that it is corporate capitalism driving the political engines of US foreign and domestic policy, wreaking havoc on civil liberties and human rights the world over and drawing America further into a neo-feudal class system controlled by a police-state. So, for God’s sake, yes — let’s unite to work for a real alternative. It’s true, the corporate-state will have its way in this campaign, no matter who’s elected. These centers of global finance will be the real winners in November, irrespective of the color of their figurehead. However, before we refuse the lesser of two evils, by either “voting with our conscience” or “throwing our vote away” because the system is indeed broken, we should think long, hard and pragmatically about the point of politics: which is not for us to devise and implement some incorruptible, ideal political system, but to ward off the most severe threats to a humane social order by restraining institutionalized greed and evil. In the language of the bible, all human institutions are fallen, but they are powers “ordained” with the task of preserving the basic social conditions in which justice and freedom can be lived. When all signs point to the fact that the regnant centers of institutionalized hubris and self-serving power decisively prefer one candidate over another, that ever-present political vocation of slowing down systems of social death should give the realists among us — who aren’t looking for a savior in any party figurehead, anyway — at least a moment’s pause.